Summer is here and it is a hot one. That is why I created the On-the-Go Water Bottle Carrier free crochet pattern. With this little carrier you will never be without a bottle of water. All you have to do is attach it to your purse, backpack or stroller and go. This water bottle holder is designed to hold a standard size plastic water bottle, but I have provided instructions to make it fit any size water bottle. We use these water bottles when we take our evening strolls through the park. Yes we really do this. We hang our water carriers to our strollers leaving our hands free to play Pokemon Go. No stroller? This crochet pattern is still worth its weight in yarn. You can attach this water bottle carrier to the strap of a backpack or purse and your other belongings won’t get wet from condensation. 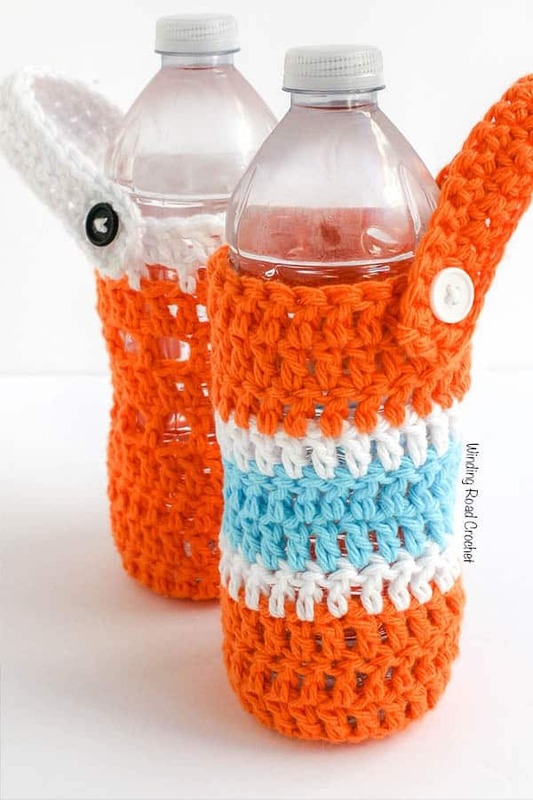 I have provided two patterns for water bottle holders so make the one that fits your style. Speaking of yarn, this project takes very little yarn and very little time to complete. If you are familiar with my blog you may know that every Thursday I release a “30 Minute Thursday” free crochet pattern and this is one of them. This project will take you less than 30 minutes to complete and you are ready to go on your adventure. Have you seen my other 30 minute projects? I decided to use Red Heart’s Scrubby Smoothie yarn that I had left over from my Fish Beach Backpack. This yarn is really soft and does not stretch like an acrylic yarn. Cotton yarn is great for items that will take lots of wear and tear. Now, let’s get started making some water bottle holders. Inc – Increase – 2 Double Crochet in the next stitch. This water bottle carrier measures 5 inches in height and two inches in diameter. Adjustments are below both patterns for larger water bottles. R1: Dc 12 in MC, Slst to first Dc.Ch2, turn. R2-a: Inc in each st around, slst to first dc, ch 2, turn. Note: If your bottle bottom is bigger than your finished Round 2, then go to the adjustments section after the pattern and complete Round 2b and 2c if neccessary. R3-6: Dc in each st around, slst to first Dc, ch 2 turn. R7: *Dc, Ch1, skst* repeat from *to* around, Slst to first Dc, Ch2, turn. R8: Dc in each st around, slst to first dc, ch 2, turn. R9: *Dc, Ch1, skst* repeat from *to* around, Slst to first Dc, Ch2, turn. R10: Dc in each st around, slst to first dc, ch 2, turn. R11: *Dc, Ch1, skst* repeat from *to* around, Slst to first Dc, Ch2, turn. R12: Dc in each st around, slst to first dc. Do not fasten off. If you want the carrier to be taller just continue adding rows until you reach the height you would like. R13: Ch 20, Sc in the second chain from the hook and each Ch, Slst to the next Dc. Turn. R14: Sc in the next 16 Sc, Ch1, Skst, 2 Sc, Ch1, turn. R15: Sc in each Sc and Ch across. Slst to next Dc. FO. Weave in ends. Once your ends are woven in all you have to do is attach a button and you are complete. You can place the button where ever you like on Row 12 of the water bottle carrier. I placed it about a 4 or 5 stitches away from the strap. Your On-the-Go Water Carrier is ready to take on the go! Feel free to change colors whenever you like to make this a striped water bottle. Note: If your bottle bottom is bigger than your finished Row 2, then go to the adjustments section after the pattern and complete Round 2b and 2c if neccessary. R3-12: Dc in each st around, slst to first Dc, ch 2 turn. If the base in not large enough after row 2 to cover the base of your water bottle then complete row 2b. R2b: *Dc, Inc* repeat from *to* around, slst to first Dc, Ch2, turn. Check the work against the base of your water bottle. If it the same size then continue to Row 3. If it is still too small then complete row 2c. R2c: *2Dc, Inc* repeat from *to* around, slst to first Dc, Ch2, turn. This should be wide enough for most water bottle bases. Continue to Row 3. Wow, wasn’t that quick and easy? Go ahead and make another on for a friend or one for each of your family members. My family just loves these useful little carriers and take them every time we leave the house. Ready for some more free crochet patterns? Here some you will like!